Brain Bracking represents my innovative take on the "Think of Any Word" plot, and unlike the traditional methods, with Brain Bracking you can immediately perform with a 100% success-rate after reading this manuscript. Also, unlike the traditional method which involves a "process" requiring a tremendous investment of time and energy, Brain Bracking is done without any fishing and without any questions - questions apparent to the audience that is. The method involves an instant stooge and you will have to ask the instant stooge a question. This is the powerful "think of ANY word" plot, done without any questions...and yes, it can be ANY word. You tell the entire audience to just THINK of a word in their mind. With your instructions (and there are no limits, they are to think of absolutely ANY word, no restrictions whatsoever! ), everyone will be only thinking of their own words. You then pick a random volunteer by throwing a ball into the audience. Whoever catches the ball randomly throws it to someone else. Then, to make things completely random, he or she throws the ball one last time to another random person. Whoever catches this final throw is then asked to come to the stage for the Brain Bracking experience. This person is indeed a completely random person. She is greeted by the performer and escorted to the center stage so that everyone can experience the fun and amazement together. The performer tells the spectator to continue thinking of her random word. After a display of just mental concentration by the spectator, the performer writes a word on his business card. He shows it to the audience so that he is committed and can't change his mind. The performer tells the spectator to say her word OUT LOUD to everyone in the audience. The word is a perfect match, and, in addition to her word, there is also something else very nicely written on the business card personalized just for the spectator so that she can treasure this amazing experience forever. Hint: It will make her feel super special and valued, and she'll never forget you. This effect uses an instant stooge and dual reality. This is an interesting variation of the thought of word effect. Be forewarned that this probably won't work for close up but it will work really well for stage or parlor. Astonishing that someone could think it appropriate to release this as a stand alone effect. It is neither original nor good. 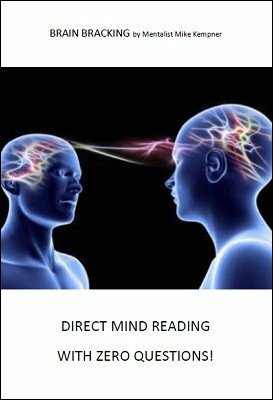 Anyone with even the slightest interest in mentalism is already aware of the use of the D*******r P*** as a technique to gain access to a thought of word. If it is not layered with other methods and presentation it is as good as useless. Like this pdf.